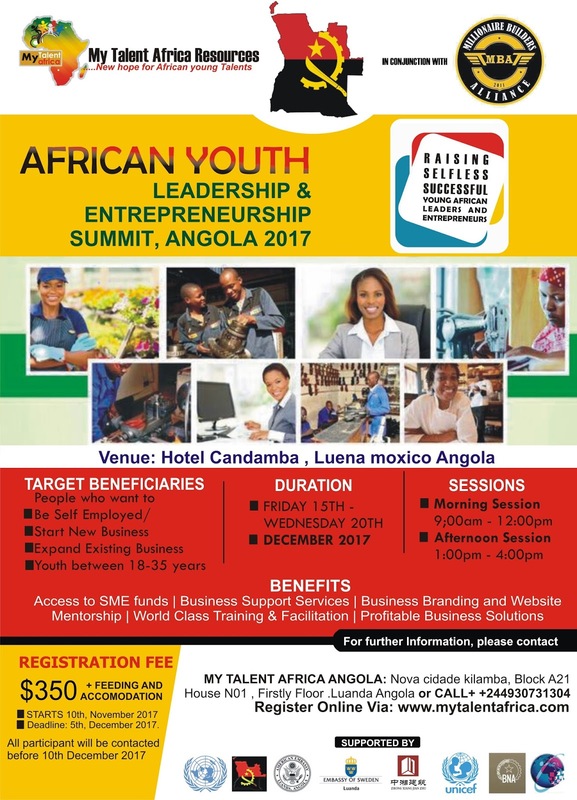 AFRICAN YOUTH EMPOWERMENT SUMMIT ANGOLA 2017. Will be the 2017 annual gathering of African young Talents, entrepreneurs and youths at all stages of business development: business leaders, youth entrepreneurs, mentors, budding entrepreneurs, investors, government officials, to discuss and x-ray the challenges and solutions proffer to youth entrepreneurship and empowerment in Africa. demonstrating My Talent Africa continued efforts and commitment in fostering youth entrepreneurship development and empowerment in Nigeria for sustainable growth and economic development. African Youth Empowerment Summit 2017 is themed Raising Selfless successful young African leaders and Entrepreneurs: A Panacea for Unemployment, Economic Growth and Sustainable Development. It is Hosted by the Movement for Talented Young Africans (My Talent Africa resources) with over 1,000 delegates, 100 exhibitors and 10 speakers. it will be the biggest entrepreneurship event to be ever hosted in Angola and will feature mentorship, conference, summit, business funding, networking opportunities, exhibition, and town hall meetings. African Youth Empowerment Summit 2017 will also empower some selected 100 youths across Africa; 50 youths will receive business funding/business tools through American Embassy Angola and Chines Industrial Fund Bank, 50 youths will receive free business websites, 100 youths will receive mentorship and 1,000 youths will receive special business training/capacity building to support start-ups and enable existing youth entrepreneurs boost their respective businesses across the country. The Event team will be submitting a comprehensive Summit Communiqué to the Angola Government in line with the findings of the summit (challenges and solutions) to youth entrepreneurship development and empowerment in Angola. Registration starts now and End on 5th December 2017.